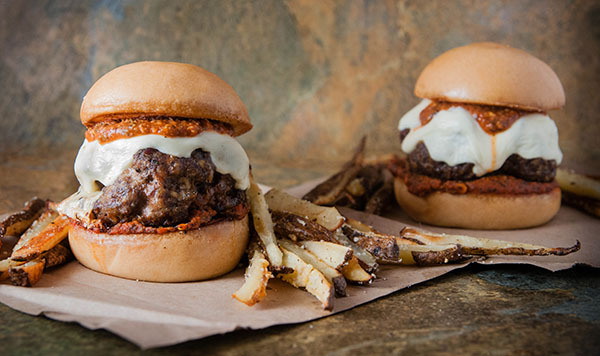 Man Food Friday is back with Mozzarella Stuffed Meatball Burgers. 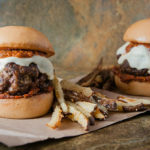 By now you know my husband loves making stuffed burgers: Jalapeno Popper Stuffed Burgers, Bacon and Cheddar Stuffed Burgers, Cheesy Stuffed Buffalo Chicken Burgers. 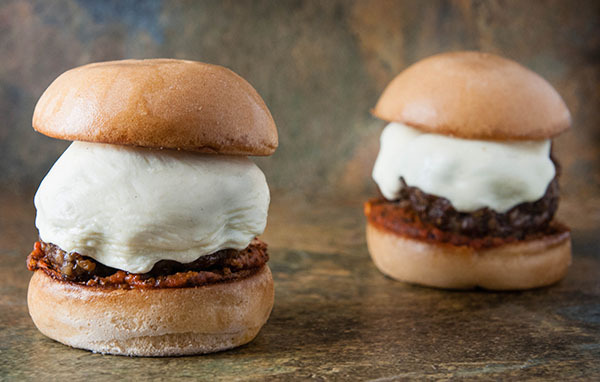 In this case these Mozzarella Meatball Burgers aren’t just a man food. They are a collaboration between my husband and our toddler. 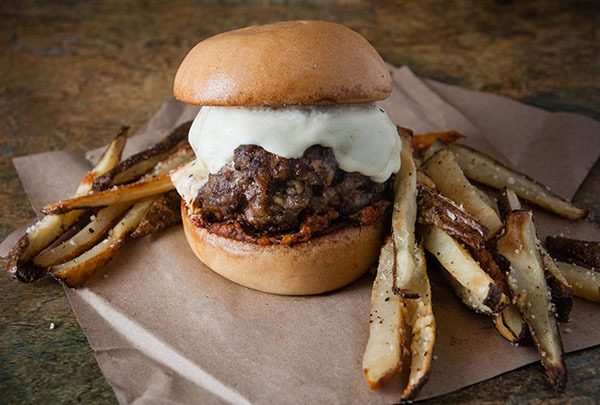 The result is an amazing mix of juicy burger and spicy, cheesy meatball. It worked out perfectly despite wherever our toddler’s hands had been before “helping” Daddy. It’s Friday. What better day to have an easy dinner that is also better than any burger you can get while eating out? OK. Admittedly, cooking with the Goose is increasingly difficult. She gets into everything. And this week her paws helped mix the raw meat used in these Meatball Burgers. Yup, she is at the age where she mostly tries hard to help… mostly. And most of the time, I tell myself it is being helpful and not some sick plot on her end to wreak havoc. It’s quite possible – though not confirmed – this time she actually wanted to help and didn’t have a hidden agenda to spread chaos and mayhem. Still, the Goose has never mixed burger meat, which meant it would be a fun experiment in patience and learning. “Ehn! Ehn!” Finger pointed to the bowl, facing contorted in annoyance. Even without words, she made it clear she wanted to do whatever it was I was doing. Now. At this point, cheese, meat, egg, and spices covered my hands. I uttered the words I’m sure the Goose is numb to hearing now, “In a minute.” I don’t even believe that any more. Logically, I couldn’t pick her up before washing my hands. But this time, it might actually be a minute. Defeated, I rinsed off my hands and picked her up, showing her the bowl. Squish! Hands, fingers, and God-knows-what went right in the bowl. She got over her shock and started to push her fingers and hands into the meat. My mind now wandered to when the last time she washed her hands and what the last thing she touched was… Oh well, heat will kill whatever she might have picked up, right? It ended up not mattering. The burgers tasted amazing after being grilled over a smoky fire. And a day or two later, none of us are sick. I consider that two wins. Well, three wins when I factor in that Lucy not only loved the burgers but she devoured the oven fries we made with them. 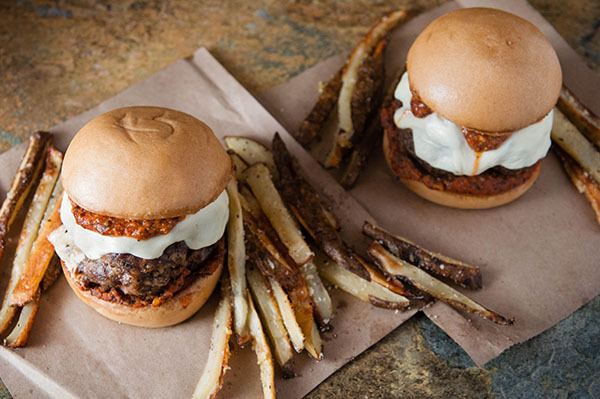 Sign up to receive the Baked Parmesan Garlic Fries Shown with the burgers! Start coals for the grille or turn the gas grille on medium heat. 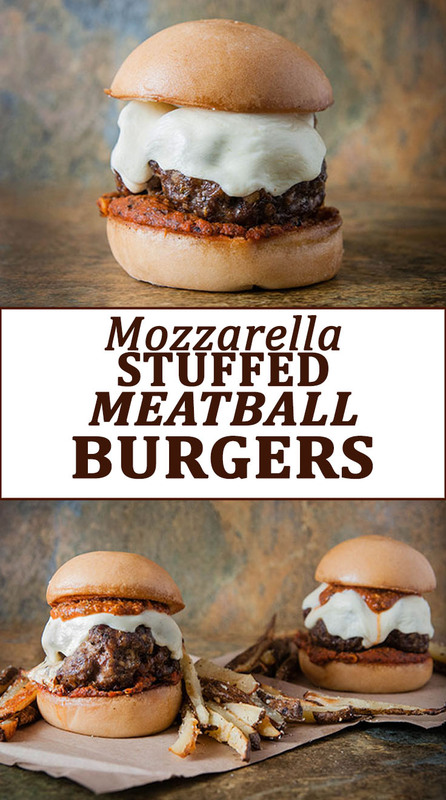 Mix in a medium bowl all ingredients for burgers except for the mozzarella cheese balls. Mix in a grille safe pot all ingredients for the sauce. Split the burger meat into rough quarters. 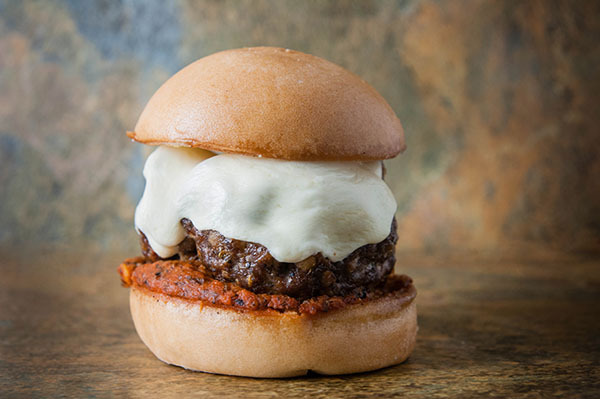 Take two pieces of mozzarella cheese and form a patty around the cheese. Make sure to completely seal it in. 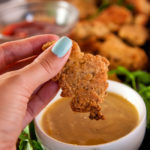 Repeat until all meat is used – you may have left over small moz balls. Place sauce on upper rack of grille. Place burgers over direct heat and cook for 4 – 8 minutes each side or until desired level of done-ness. Stir sauce occasionally. If needed, move over direct heat and cook until bubbly. 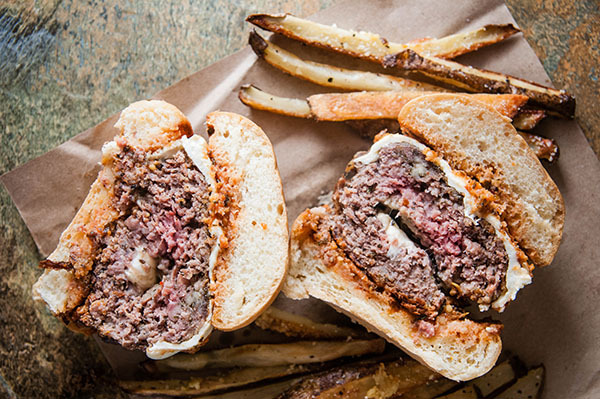 Slice the large ball of mozzarella cheese and place a slice over each burger and melt. 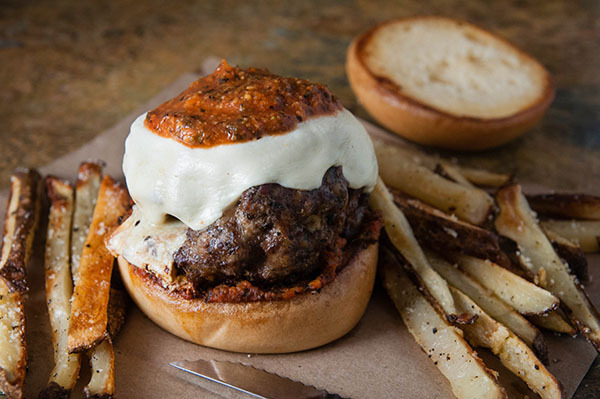 Charcoal grilles work best to get the smoky flavor for both the sauce and the burgers. Those look AWESOME! Really craving a burger now! Definitely going to save this recipe! These sound and look absolutely delicious! Will be making these very soon. Thank you for this recipe! holy moly these look delicious! 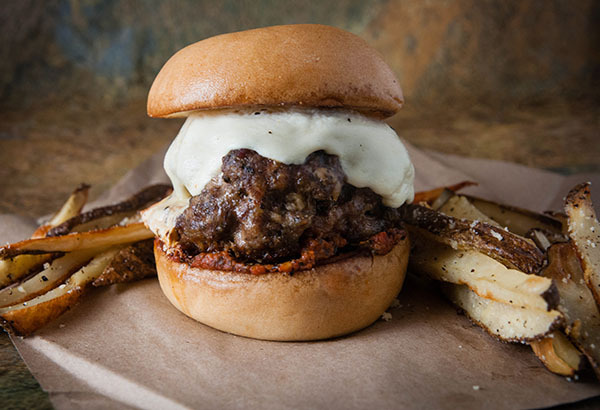 we are huge burger lovers and I am adding this to our menu next week! Omg yum! I’m going to try these with Daiya dairy free mozzarella & gluten free breadcrumbs!!! We used gluten free breadcrumbs as well when making them. Wow these look amazing! I need to make them this weekend! Yum! 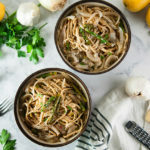 This looks so delicious and it doesn’t even take to long to prepare. May have to try this over the weekend. 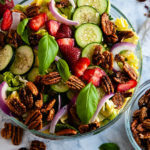 This recipe looks great, I can’t wait to try it! Thank you for sharing and have a wonderful weekend! These look amazing! Mozzarella is one of my favorite cheeses; I’ll definitely be trying these soon! I love meatballs and these sound amazing! 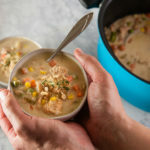 I think I need to make them for dinner this weekend! I totally call buns adorable. Buns of the burger and baked variety that is. I get it. Wow, those burgers look huge! And delicious too! They were gigantic. It took me 2 meals to finish mine! 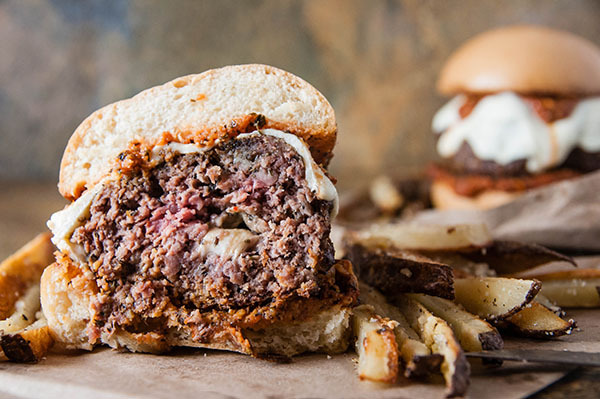 This burger looks amazing! And I love that you call it Man Food Friday. Cracks me up! This burger was amazing. And it is total Man Food. I’d never think of this…ok or I would, but I’d probably be like, I should go eat some quinoa. My husband, however, is like, DO IT. Eat allllll the burgers. I’m glad he wins sometimes. Holy smokes! These look amazing. Give me all the cheese! Oh. My. Goodness! I am literally drooling! These sound delicious!